← How does the Internet Course Work? Awesomely! 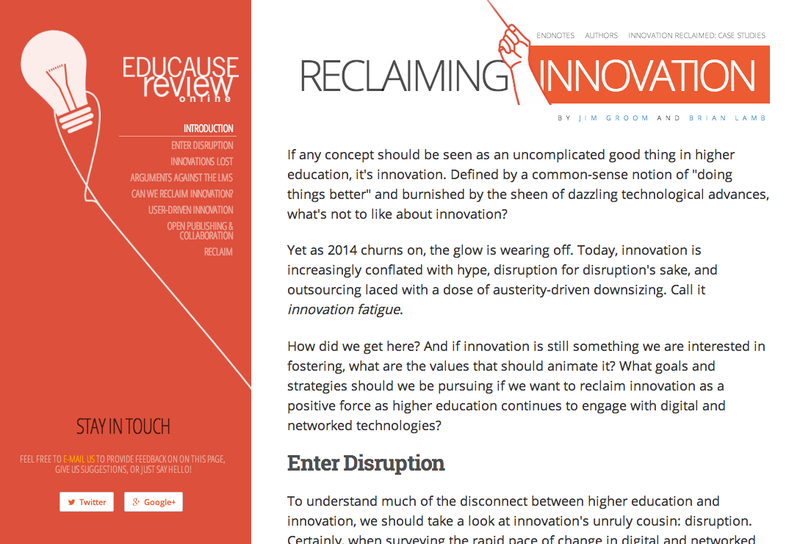 Yesterday the online version of the EDUCAUSE Review article Brian Lamb and I co-authored went live on the web. I’m really blown away by how much time and energy the good folks at EDUCAUSE Review spent on the web presentation. It looks amazing, and I have to acknowledge right up front that ER editor, Teddy Diggs, was nothing short of amazing throughout the entire process. I had a lot of fun writing this article, and it’s really rewarding to see it both online and in print. It represents yet another proud moment within an on-going intellectuall (and degenerate) collaboration I’ve had with Brian for going on eight years. More selfishly, this article helped me both crystallize and abstract a series of ideas around Domain of One’s Own that needed to be generalized beyond UMW. Originally the idea behind this article was to write a piece about Domain of One’s Own touting its awesomeness (and it is!). But when I started talking it over with Brian it quickly became apparent that a broader rumination on the state of innovation and technology in higher education would get at some of the deeper underlying issues that Domain of One’s Own addresses. 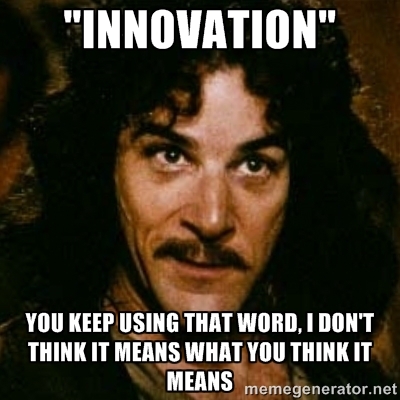 What exactly do we mean when we say innovation? What is this disruption we keep talking about? What is the state of innovation in higher ed when it comes to IT infrastructure? How have we fared in terms of providing spaces for our intellectual communiities to explore the possibilities of the the radical “disruptor” know as the web? Is empowerment a part of innovation? The article is an attempt to answer just those questions, and I think it helped me re-focus some of the reasons why I think Domain of One’s Own, and the Reclaim Your Domain movement more generally, remains my chosen future. The online piece provides a series of extras, such as clips of a conversation between Brian and I embedded in the article about the process. Also, there are a series of examples of schools like UMW, UBC, and various CUNY colleges that are enacting the values at the heart of building a technological infrastructure for teaching and learning around people. In addition, for the online version I spent many hours alongside Andy Rush interviewing staff, faculty, and students at UMW to explain what exactly Domain of One’s Own means to our campus. The following 12 minute video, embedded below, is the result of that exploration. And if that’s not enough, Brian and Jon Fulton were, as luck would have it, able to sit down with both Audrey Watters and Kin Lane at Thompson River University to discuss what exactly this whole “reclaim” thing is all about. I think they both lay out a brilliant frame for what this might mean on a personal level. I’d like to think their vision is complemented by Domain of One’s Own at UMW, suggesting that such an ethos can work on several levels: personal, professional, institutional, etc. There’s a spectrum to reclaim. It’s not a reaction; it’s a proactive move to start demanding we have more control over who we are in cyberspace. For UMW, reclaim is about factoring the importance of taking ownership of your information into the work you do not only as a student, but as a citizen. Brian and I fashioned this piece as a re-visiting of the “Nevermind the EDUPUNKs” article we wrote for EDUCAUSE Review in 2010. Four years on I remain confident that empowering individuals to reclaim their work online is not just an idea, but an infrastructure that folks can and will actually work towards impelementing. If we think that teaching and learning in the 21st century needs to deeply interrogate the role of the web in education, and that’s becoming readily apparent, then I can’t imagine how the vision of the student, faculty, and staff member as various nodes within a broader learning network framed by the course or the unviersity or the world at lerge can’t be anything but imminent. Here’s to hoping. This entry was posted in reclaim, reclaimopen and tagged EducuaseReview, reclaim hosting, reclaimhosting, reclaimopen, reclaimyourdomain. Bookmark the permalink. Here’s to at least eight more years of intellectual degeneration. As ever, it was a blast and a privilege to work with you. Your Domain of One’s Own work is truly ground-breaking, and I’m happy that EDUCAUSE REVIEW can play a role in showcasing at least some of what you and your team have accomplished. Looking forward to seeing what’s next from you all.